Steam's Autumn Sale 2017 has kicked off. The games-centric software distribution platform is promising "great deals across the Steam catalogue throughout Black Friday and Cyber Monday". Actually, it runs until Tuesday 28th Nov at 10am PT (6pm in the UK). As usual, throughout the sale period, Valve will have daily deals and special prices available for titles and a number of franchises. It's sometimes hard to know when the best price will appear for games that you are interested in. However, it won't be that long until the Winter Sale if you miss a special offer and it isn't repeated during this particular event. 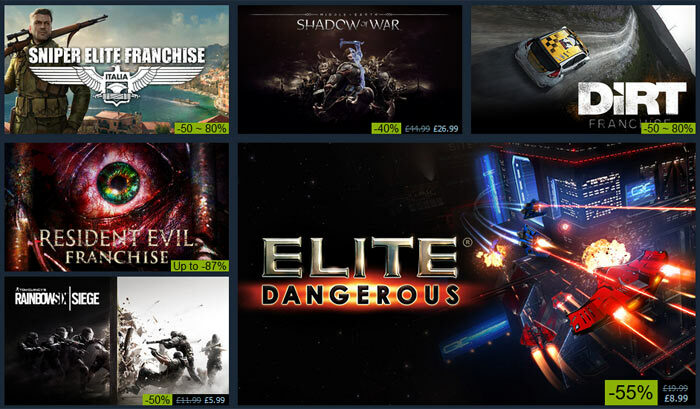 On the front page of the sale right now you can see offers of the Fallout franchise, up to 75 per cent off, the Resident Evil franchise is being sold with discounts as big as 87 per cent off, and the Sniper Elite franchise games are cut by as much as 80 per cent, as are the Dirt franchise games. The previous news piece on HEXUS pointed out that VRMark is also on sale - at 75 per cent off for the duration. Hardware is on sale too, let us not forget. If you look at this section of the Steam Store you will be greeted by hardware deals showing as much as 90 per cent off. The star of this show is the Steam Link, reduced to just £3.99 in the UK (down from a £39.99 launch price). The Steam Controller is reduced by 33 per cent to £26.79, and a bundle of the Controller and Link is only a little more: £27.70. If you find any bargains you think are worth pointing out to fellow HEXITES please do so in the comments section below. I notice that Elite Dangerous is 1p cheaper on Steam than on the Frontier website. Now I bought the game ages ago from Frontier which means I get Steam and Oculus license keys included, does that go the other way around though so if you buy via Steam (which would be easier) you can get the full Frontier account? Wolfenstein II: The New Colossus - £19.99 worth a look? There's a free trial that has just become available. Go and test it out before you buy? Definitely - the characters feel really human, the story is absolutely nuts and the gunplay feels great! Delivery on Link/Controller combo was almost as much as the package itself. No thanks.